My work Dedicated to Marc Chagall is based on the popular Jewish song Hava Nagila, which means Let us rejoice. 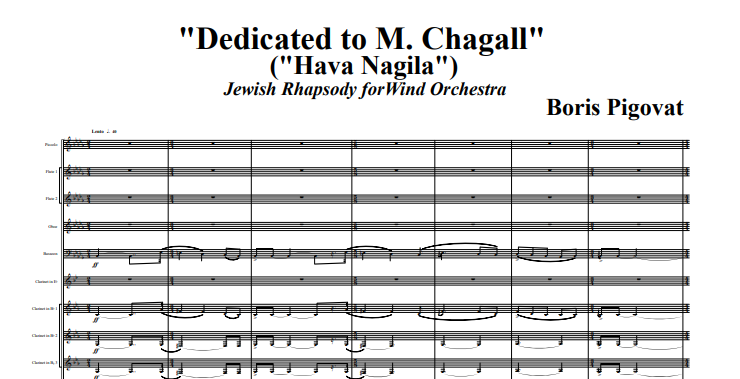 I had originally intended to write a rhapsody based on Hava Nagila, but I found myself writing episodes that were not derived from Hava Nagila. Suddenly, I realized that I was actually composing a tone poem, evoking scenes of a small Jewish town at the beginning of the 20th century. Such images and moods typify novels by Shalom Aleichem and the earlier paintings by Marc Chagall. I felt a particularly strong association to Chagall’s pictures. For this reason, I named the piece Dedicated to Marc Chagall, in addition to the secondary title of Jewish Rhapsody “Hava Nagila”. I composed the piece in 2003, for wind orchestra, and then for string orchestra (with optional piano). The main part of both versions is similar, but the nature of strings required a completely different introduction for the string version. The wind orchestra version premiered in 2003, performed by the Petach-Tikva Conservatoire Symphonic Band at Festival Kfar-Saba (in Israel), and conducted by Michael Delman. The premiere of the string-orchestra was in 2005, performed by the Ramat Gan Chamber Orchestra (in Israel), and conducted by Aviv Ron. Later, both versions were performed many times in Israel and around the world. In 2005, I was contacted by the Brandt-Brass Ensemble from Saratov, Russia. They sough a challenging piece to perform for international competition, and I prepared for them a version of Dedicated to Marc Chagall for brass ensemble. The piece has already seen many variations, and who knows where else it will go?